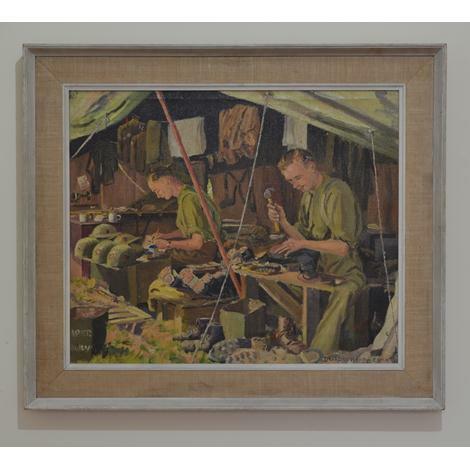 Seemingly oblivious to the artist and enveloped in a world of routine, two young Privates from the Royal Artillery are depicted maintaining the most fundamental items in a solder’s kit. On the right, boots, boots and more boots are being given a longer life by segs hammered into their heels and soles, whilst on the left, helmets are being painted with the Royal Artillery’s distinctive blue and red diamond flash insignia. 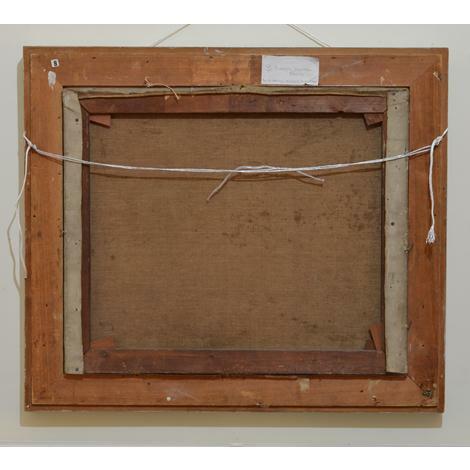 The companion piece The Kit Fatigue displays a Southern Railway label (verso), for Robertsbridge, on the stretcher, indicating that the canvases were transported in goods vans, presumably to a station close by the camp - Robertsbridge, in Sussex, is approximately ten miles from the south coast. Quite possibly on air defence duty, then, the soldiers prepare for action. Behind them, on the very far left of the picture, the presence of a sewing machine serves to heighten the very ordinariness of the house-keeping scene.